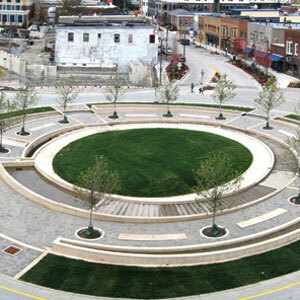 In Uptown Normal, Illinois, Hoerr Schaudt Landscape Architects completed work on The Circle, a multi-functional, sustainable roundabout that cleanses and re-circulates stormwater into a public fountain, improves traffic circulation at a busy five-street intersection, and provides community green space. 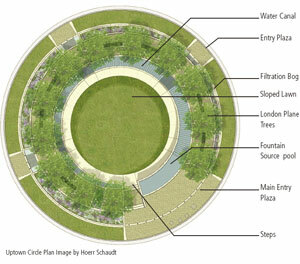 The site’s stormwater management system features innovative elements like filtration bogs, ultra violet sanitizers, and a “structural cell system.” The Circle plaza sits adjacent to the town’s planned multi-modal transportation center, which will connect residents to bus, train, or bike routes. The plaza and center received a U.S. Department of Transportation TIGER grant. “Water goes through a filter that traps excess debris. The water is filtered, then travels through an ultra violet sanitizer. Ultra violet light energy helps destroy micro organisms without using harmful chemicals that create a “dead zone” which can be toxic to humans and animals. The water is pumped up through the “bog” plants that will also help to clean the water by filtering excess sediments and absorb remaining toxins in the water. While the water isn’t drinkable, park visitors can dip their feet in the fountain. Excess runoff not captured by this sytem is funneled to a 76,000 gallon underground cistern, created from abandoned underground storm sewer infrastructure. 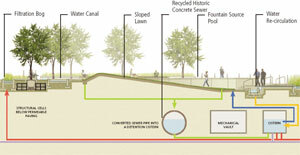 Water in the cistern will be used to irrigate the surrounding street trees. The new roundabout should reduce traffic accidents. According to Federal Highway Administration (FHA), installing roundabouts results in: 90 percent reduction in fatalities; 76 percent reduction in injury accidents; 75 percent fewer pedestrian and vehicular conflict points; and reduction in overall pedestrian injury. Hoerr Schmidt says roundabouts also help reduce idling, which in turn helps lower local air pollution. See more images. Also, check out a review from The Architect’s Newspaper. Previous Article Can Afghanistan’s Poppies Be Converted into Biofuel? The sound that masks traffic noise also masks it for blind pedestrians. The use the sound of vehicles to judge when it is safe to cross a street. Masking that sound means you’ve made it that much harder for all users. How much sound do slow cars make that it needs to be masked? It is not generally the case that pedestrians should be accessing the central island of a roundabout. But never say never! As a roundabout designer I have had to access central islands many times and it is hazardous, especially in the UK where drivers drive much too fast around them. I have found that the only safe (or least dangerous way) is to cross to or from a splitter island. There is usually significantly less flow circulating at these points and it is much easier to see what is going on. Even at this late stage I would urge addition of crossing points from the medians/splitter islands and consider closing the locations between the roads. When there are no cars allowed but for those who can afford fuel at say $15.00 a gallon they will become hubs for public transportation. The goal is ZERO cars Clive; busess, trams, trains and bicycles. It’s called the Rewilding of North America and is clearly part of the UN Agenda 21 policy. 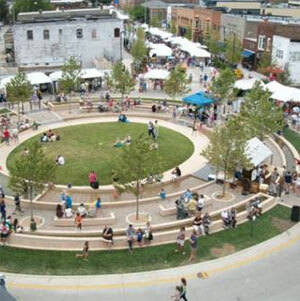 There will be plenty of room to hangout n the circles! We love having this amazing fountain in our community!